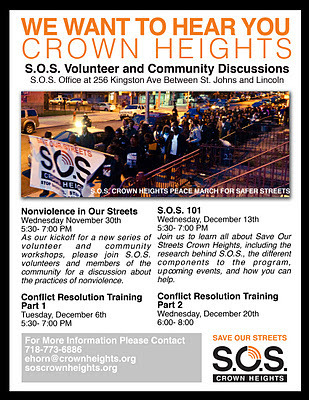 As the kickoff for our new series of volunteer and community workshops, please join S.O.S. volunteers and members of the community for a discussion about the practice of nonviolence. Wednesday, December 14th; 5:30 - 7:00 PMJoin us to learn all about Save Our Streets Crown Heights, including the research behind S.O.S., the different components to the program, upcoming events, and how you can help. Learn basic tools and techniques for improving your communication skills so that you can decrease conflict in our lives and on our streets. Also see these events in our calendar to the right.